Bombs exploded Sunday in Baghdad and the northern oil center of Kirkuk, killing nearly 60 people, police said, and dramatically escalating tension as the prime minister left for Washington for talks on reversing the country's slide toward civil war. The blasts occurred as Iraqi forces and the U.S.-led coalition mounted a major crackdown on the country's most feared Shiite militia, the Mahdi Army, blamed by Sunnis for many of the sectarian kidnappings and killings which threaten to tear the country apart. The Baghdad bombing occurred when a suicide driver detonated a minivan in the Mahdi Army stronghold of Sadr City at the entrance to the Jameelah market, packed with shoppers and vendors on the first day of the Iraqi work week. An Iraqi army statement said 34 people were killed and 73 were wounded. Eight more people were killed and 20 wounded when a second bomb exploded two hours later at a municipal government building in Sadr City, the Iraqi army said. In Kirkuk, a car bomb detonated at midday near a courthouse in the city market district, killing 17 and wounding 30, according to police Brig. Gen. Sarhat Qadir. It was the fourth car bombing this month in Kirkuk, where tensions are rising among Arabs, Kurds and Turkomen for control of the area's vast oil wealth. The wave of bombings, shootings and sectarian killings has plunged Iraq's new unity government into a deep crisis only two months after Prime Minister Nouri al-Maliki took office, pledging to pursue national reconciliation and to pave the way for a U.S. military withdrawal. Instead, the U.S. military is planning to bolster its forces in Baghdad to cope with the security crisis. Al-Maliki and a large delegation left Sunday for Washington, where he will meet President George W. Bush on Tuesday. Security is expected to dominate the talks. In Sadr City, dazed and angry people milled about the car bombing site, many of them still reeling from the effects of an early morning raid against what the U.S. military described as "death squad" members. "We could not sleep because of the raid, and today we woke up with the explosion of the car bomb," one man told Associated Press Television without giving his name. "How long is it going to be like this?" Police searched through the wreckage of the car bomb for more victims and warned bystanders to leave or they would be arrested. An elderly man, his clothes soaked in blood, wept as he called out the name of a missing relative. 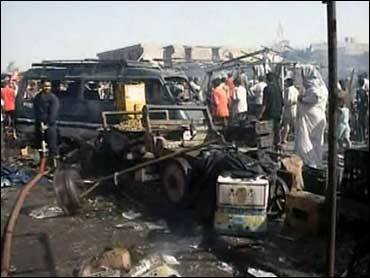 It was the second major car bombing in Sadr City this month. A blast July 1 killed 66 people, and set off a new wave of reprisal killings and kidnappings of Sunnis by Shiite extremists seeking revenge. Key to ending the reprisal attacks is to rein in sectarian militias and death squads that U.S. officials now say are a greater threat to Iraq than the Sunni insurgents who have been fighting the coalition since 2003. The Mahdi Army is believed to be the biggest Shiite militia. Before dawn Sunday, Iraqi troops and U.S. advisers raided Sadr City and the mostly Shiite district of Shula, U.S. and Iraqi officials said. The sounds of explosions and bursts of automatic fire echoed through the heart of the capital. Two hostages were freed in the Sadr City operation. Two people were arrested in Shula, officials said. Last weekend, British troops arrested the commander of Mahdi forces in Basra, Iraq's second largest city. On Saturday, U.S. and Iraqi troops battled Mahdi fighters in Musayyib. 40 miles south of Baghdad in a three-hour gunbattle that killed 15 extremists and one Iraqi soldier. The security crisis has diverted attention among the Shiite political establishment from the Israeli attacks against the Shiite militia Hezbollah in Lebanon. Nevertheless, some Shiite politicians had urged al-Maliki to cancel his Washington trip to protest the Lebanon attacks. Al-Maliki, a former Shiite activist who spent years in exile in Syria, has condemned Israel's offensive and has complained that the United States and the international community have not done enough to stop it.